Mrs. Levin (1913 - 2000), the widow of Philip J. Levin, a lawyer and real estate developer, took over her husband's business after his death in 1971. She was also president of the Philip & Janice Levin Foundation. The foundation was a major contributor to the renovation of the 19th-century paintings galleries at the Metropolitan Museum of Art, and Mrs. Levin's name is on one of the galleries. A number of her paintings, including works by Degas, Pissarro and Sisley, have been pledged to the museum. Mrs. Levin also gave paintings to the Museum of Modern Art and created a fellowship to encourage the development of young scholars and curators. Last year, through the Friends of Art and Preservation in Embassies, she endowed and dedicated a sculpture garden at Winfield House, the residence of the United States ambassador to Britain. A toddlers' playground in Central Park was endowed in memory of her son, James Michael Levin. Mrs. Levin was a longtime board member and benefactor of the School of American Ballet and a patron of both the New York Philharmonic and the Metropolitan Opera. Born in Manhattan on July 3, 1913, Mrs. Levin was the daughter of Rene and Samuel Hoffman. She attended Hunter College and New York University. Her survivors include a daughter, Catherine Levin, and a son, Adam Levin, both of Manhattan, and three grandchildren. A massive marquise-shaped diamond! 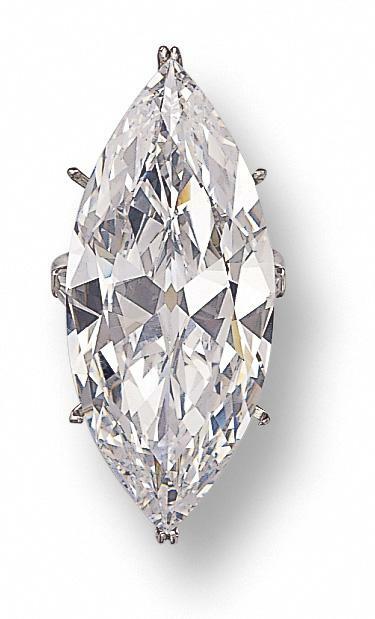 This stone came up for auction at Sothebys in April of 2002, as part of the estate auction of Janice H. Levin. The marquise-shaped diamond weighing 37.25 carats, flanked by 2 tapered baguette diamonds, mounted in platinum, signed Winston. Accompanied by GIA report no. 11568034 stating that the diamond is D color, VVS1 clarity. 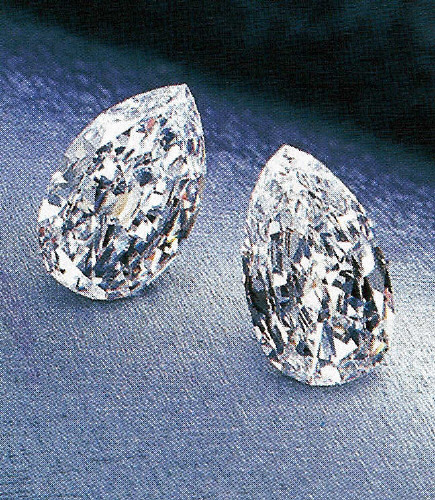 Marquise diamonds this size are very rare, this is due to the fact that the marquise shape tends to waste alot of rough stone. Marquise shapes tend to be more valuable for this reason. This stone is a museum-quality piece with very high clarity and a "D" in color. I don't think this stone even really has a name... so I named it the Levin Marquise for this site. The 2 pear-shaped diamonds weighing 22.04 and 22.11 carats respectively, within simple platinum pendant mountings, unsigned, purchased from Van Cleef & Arpels in 1968. Accompanied by GIA report no. 11568027 stating that the 22.04 carat diamond is D color, VS1 clarity, and no. 11568029 stating that the 22.11 carat diamond is D color, VS1 clarity; together with original working diagram stating that the stone may be potentially flawless. Also accompanied by Gubelin report no. 0111098 stating that the 22.04 carat diamond is D color, VS1 clarity, and no 0111097 stating that the 22.11 carat diamond is D color, VS1 clarity. Each report is accompanied by a letter from the Gubelin laboratory stating that the diamond possesses a purity of color and degree of transparency which are particular to the finest of natural color Type IIa diamonds. 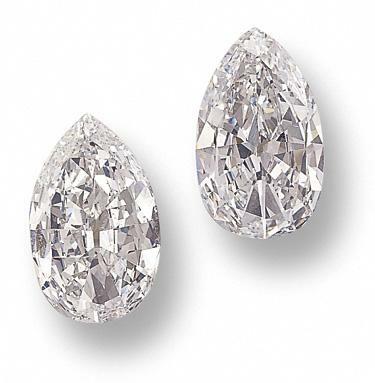 Diamonds of this type and size, exhibiting a superior quality, are rare. Such diamonds have been unearthed from only a limited number of sources around the world (e.g. South Africa, Brazil, and India). The Levin Pears aren't just both pear-shaped but also nearly identical. As the certificates from the Gubelin lab attest, these diamonds have been graded as Type IIa. This rare category includes those very few stones that are free from nitrogen and are therefore chemically pure and colorless. Historically, the best known source of type 11a diamonds is the Golconda mines in India, now part of the state of Hyderabad. These river bed deposits have been exploited since antiquity and have yielded some of the world's greatest diamonds including the Koh-I-Noor, the Great Mogul and the Regent. The term "Golconda" has since come to define those very few diamonds with the finest white color and degree of transparency particular to these stones of legend.